Threadcakes 2011 is wrapping up this week, so let's take a final look at some more of the amazing entries, shall we? As before, we'll start with the shirt design, followed by the cakey re-creation. Links go to the creator's page on Threadcakes. By Carly Geehr; click here for more of her work. This is only a small sampling of the Threadcakes entries, by the way. Check the gallery here for lots more. And if you'd like to submit your own cake, hop to it! The deadline is tomorrow! Have a Sweet to nominate? 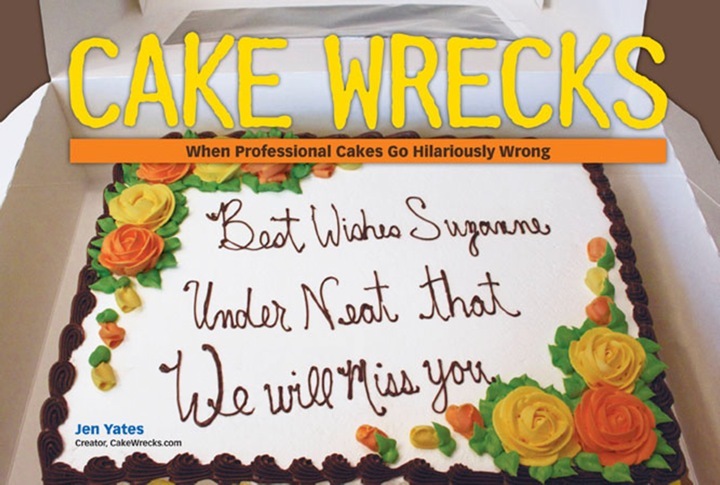 Then send it to Sunday Sweets [at] Cake Wreck [dot] com. Amazing skills on show, but some of the subjects are just too creepy ..the dead fox for instance and the nuclear bomb with birds. Like the Hoo's though thats classy! Wow, they're all so beautiful. I find "Second Sun" pretty disturbing, but I guess that's the point. Argh...as if I didn't have enough clothes! I am now one up. That Doctor Hoo is too cute for words! I have the Doctor-Hoo shirt too! I'm so glad someone made it into a cake! After spending some time looking through the entries, I agree that it would not be easy to showcase all your favorites. I was also impressed by how many, let's just say...probably did not turn out as envisioned. WOW! Those cakes are truly, wonderfully, amazing. Well done, bakers!!! So cool! I am totally in love with the Muppet one! I want the shirt! I'm so glad I don't have to judge these because they're all totally jaw-dropping. Good luck with that! The level of talent here is mind boggling!! I'm truly glad that I don't have to pick a winner. They're all so amazing! "The Fox Confessor" is by far my favorite. Beautiful artistry! I have a particular affinity for the Doctor Hoo design as well because my sister made the cake!!! :) :) So proud of her - she's amazing. Thanks for featuring it here , totally made her day. I so hope she wins. The fox and the camera(butterfly) ones are my favorites...well done by all! So...I was scrolling back the other day, trying to catch up on all the older posts since I've just recently become a fan (Yes, it's sad. LOL!). And I came across another post about Threadcakes. And went to the gallery. And drooled. And ordered a shirt. The nature photography one, since I'm a photographer. And I wanted a bunch more. And the price was so stinkin' reasonable! And the cakes...while some are...not so hot (almost wreck-like)--some were absolutely stunning! Amazing work! I'm going to have to buy the Muppet shirt. In honor of the new movie...sure... that's a good excuse. What talented bakers/decorators you've showcased! Good luck choosing! @diddleymaz "The Fox Confessor" is from a series of Ukrainian folk stories. The fox, like the Coyote "trickster" of North American First Nations mythology*, Fox is noted for his cunning and wit in turning or trying to turn any situation to his own benefit. This is why Fox, in the painting is laughing or possibly singing ("He sang nursery rhymes to paralyze the wolves that eddy out the corner of his eyes"**). ** Neko Case used the theme of one of those stories "The Fox Confessor Brings the Flood" for her 2006 song and album titles of the same name. I LOVED the store tellers cake! So creative! I wish I had cake decorating talent, or could draw for that matter. Absolutely love these. I can't even believe how many talented people there are out there! Incredible! In taking a closer look at the cake, I believe it is, in fact, referring to the "The Fox Confessor Brings the Flood). on the base is a hint of the flood beginning. @anneke I'm in the UK..and although I've never heard of neko case I am familiar with the idea of the wily fox BUT I stll think that like the clown van thing it's just creepy and doesn't make a nice cake. Even though its well done I just don't like it after all lots of things are well done but it wasn't necessarily a good idea to do it! Wow, amazing talents; I personally love 'Storytellers'! August 14, 2011 | Heather J.
Squee! I want the Muppet shirt! I love it! I love the "Doctor Hoo" cake!! Had to go to the contributor's website for a higher-res photo. What clever interpretations of the eleven Doctors! I want to live in that playhouse. The shirt wasn't that impressive, but the cake was adorable!!! Wow! If you put one of those cakes in front of mr I wouldn't know HOW to cut it, et alone if I had the courage to. I can't decide which is my favorite, although I'd be giving special honours to 'Recording Seal' and 'Second Sun'. I think the "Storytellers" cake is the cutest cake I've ever seen! These cakes are absolutely fantastic! You've had cakes from the contest before, and they are always incredible! And, I had to order the "Happy Accident" shirt -- just too funny! As a recently converted Whovian i simply ADORE the "Doctor Hoo" cake (and tee). The Recessionopoly and Muppets also were simply fantastic! Wow just..wow. All of those cakes are amazing. It was hard to tell what was a shirt and what was cake lol. My favourite is "My Playtree." WANT. i have that toast shirt and i should point out that the shirt starts off with them as two slices of bread. when you go out in the sun, they turn to toast and the tan lines appear. it's so cute! these cakes are all so amazing. i have to get that muppets one. I have the Doctor Whooooooooo t-shirt... I can not believe how utterly fantastic that cake is!!! So surprised you didn't include A Long Time Ago. (And you call yourself a geek! LOL!) There are some truly amazing cakes here and at the Threadcakes site! Stunning! Just simply stunning! I do not envy you your task, Jen. Good luck! Wow! Fox Confessor (the original piece) is by one of my favorite artists, Lindsey Carr. Love to see great work spreading!! Where in the world do you find these in t-shirt form!? I must have some of them! They are incredible in cake form too (wish I could sit and stare at them for hours each!). Thank you! I love the fox cake! Just look at the detail. Why call that creepy? Look at the art that went into the t-shirt design and then just look at that talent Ashley has to make such a cake. I'm not biased, even if she is my old roommate's daughter. When I first saw this post, I scrolled down just enough to see the first picture, but not the caption, and my though was "Dr Who scarf!". I love the shirt. And I am sooooo not surprised that Jon bought it. Jen, as always, the Threadcakes you post here are amazing. Judging must be a real challenge. I agree with most of these: a lot of them have clues in the original drawing - for instance, there's a little spider with the pig, which makes sense if it's Charlotte's Web - but I'm not sure about the last one. I thought maybe BLUEbeard rather than Blackbeard. I can't think of a specific pirate who's usually depicted with an eye patch, a peg leg, *and* a hook - unless the original Captain Hook had the patch & leg? You can get a good look at the image on the designer's website: 1st picture in the 3rd row under Vector Illustrations. Every time I want to buy this shirt it's sold out. Sigh. its two top hats instead of one!!!! looks stupid with just one. also the colors of the stipes on the hats, neck ties and hanky/vest and how one has his pinky extentded and the other dosnt. ones "light" ones "dark" i think they were dueling an alternate version of themselves. i thought the idea of thread cakes was to take what you see and turn it into cake not change it into your own design. i do like the detail tho but they are not the same image. baker totaly reimaginded it. not what i think thread cakes are about.